#AskTDS: "My tenant wants their partner to move in with them; how will this affect the deposit?" In this week's #AskTDS, we answer a landlord’s question: "My tenant wants their partner to move in with them; how will this affect the deposit?" Moving in with a partner is a big step in any relationship, but aside from considering whether you can cope with your partner’s smelly feet or penchant for eating biscuits in bed, there are also implications for the tenancy deposit. Tenants wanting to make a change to the tenancy agreement should always check whether moving a partner in to the rented property is allowed; there are not only legal factors to be considered but this can have a knock-on effect for the tenancy deposit, its protection and who it’s returned to at the end of the tenancy term. For example, if a tenant is currently staying in a privately rented property and they want their partner to move in with them, they may have to seek permission from the landlord, or letting agent acting on the landlord’s behalf, to confirm that this is going to be agreeable. The tenancy may already set out what can and cannot be done. This should be arranged formally and in writing as with any transaction. The path of true love is not always smooth! The landlord or letting agent can then confirm whether the change can be agreed and under what terms - there may even be a formal document to complete. This is because the landlord may want the new party to the tenancy to be added to the agreement, or allow them to live at the property as a tenant or a permitted occupier. If they’re considered a tenant, and the tenancy reflects this change, the landlord or agent will have to add them to the tenancy agreement and they will need to agree to be bound by the terms of the tenancy (often even from when it started). These considerations will then determine how the landlord deals with any tenancy deposit as they may have to amend the registration with the deposit protection scheme they use and issue new documents. Tenants should always ask permission to move a partner in, even if there is no specific clause prohibiting it in the tenancy agreement. It’s important to ensure this happens as it can affect the performance of the tenancy. To ensure that everyone involved is properly protected, the change may also affect the rent. What about if the partner pays half of the rent – will that be considered a sub-let? We face this kind of question regularly from both tenants and landlords. To clarify, the tenant is the person listed on the tenancy but there are some areas that landlords should be aware of that could cause legal issues. For instance, if the person not listed on the tenancy can prove that they paid rent directly to the landlord and this was accepted, this may suggest that they had been recognised as a formal tenant. This is a legal question and landlords will want to ensure they protect themselves and their tenants to make sure all amendments are done correctly. Landlords must act as soon possible if they have discovered a breach of the tenancy agreement terms; usually, the agreement would prohibit sub-letting or under-letting of the accommodation without formal authority. For landlords who are adding a new tenant, we recommend creating a new tenancy agreement or an addendum as it better protects them and records what has been accepted by all parties. In addition, the landlord or the letting agent should make sure that, if required, new Prescribed Information is issued and that the incoming tenant agrees in writing to be bound by the original inventory. If the incoming tenant refuses to do this, you may wish to consider checking out all tenants to avoid disputes later on. 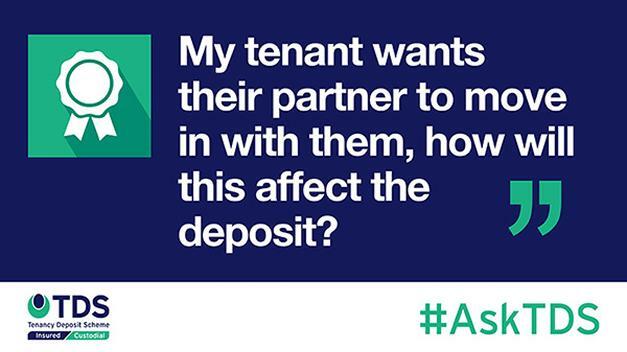 This will help clarify who gets any amounts from the tenancy deposit that remain once the tenancy has ended. Like all good love stories, there are some key administrative burdens that need attention in these situations and moving a partner into your home is exciting but some of these changes often get forgotten. Landlords should bear in mind their responsibility to ensure that tenants in their properties are properly protected and are not in breach of their tenancy agreements. Managing this change and completing the documents correctly as soon as possible help ensure the letting and love don’t go sour! Find out more about Tenancy Deposit Scheme (TDS) here. TDS can only comment on the process for our scheme. Other deposit protection schemes may have a different process/require different steps. Content is correct at the time of writing.